Hazelton Homes has won an esteemed industry award for a housing development which revived derelict Grade II Listed buildings in Rutland. 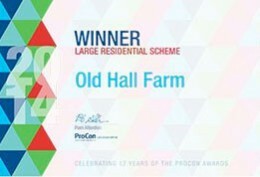 The Old Hall Farm development in Cottesmore triumphed in the large residential category at the ProCon Awards for Leicestershire and Rutland. Hazelton Homes converted the last remaining outbuildings belonging to Cottesmore Hall into 12 homes and built a further 13 homes on the adjoining land off Hall Close. The scheme’s careful marriage of the old and new impressed the ProCon judges and members. Hazelton Homes Managing Director, Tom Hazelton, said: “It’s a real honour to be recognised by our peers for a development we’re extremely proud of. “Old Hall Farm is a sound example of how the old and new can merge to create an attractive, sustainable development on brownfield land. The listed buildings date back to the 16th century and are believed to have been used as stables and a cottage. Cottesmore Hall was located to the north of the site and was home to the Countess of Lonsdale. A fire all but destroyed the hall in 1928 and it was demolished in 1974 to make way for new homes at Cresswell Drive. Rutland County Council gave permission for the outbuildings to be converted in 2002 but the work did not progress. Three further planning applications were submitted before Hazelton Homes bought the site in 2010. The development progressed throughout the recession, with Oakham-based estate agents Moores brought onboard to help sell the properties. The final home was occupied earlier this year. The ProCon Awards are known as the biggest celebration of the built environment and the people who develop, design and construct winning developments. More than 600 people attended the 12th annual awards ceremony at the King Power Stadium in Leicester on Thursday (13/11). Other finalists in the large residential category were The Ashton in Hinckley, a converted warehouse which became a 72-bed nursing home constructed by Wynbrook, and The Courtyard in Quorn, an apartment development within a former police station designed by architects LE1. Hazelton Homes are pleased to be able to offer the innovative Government Scheme, Help to Buy on its properties. To find out more about this scheme visit our Help to Buy page.